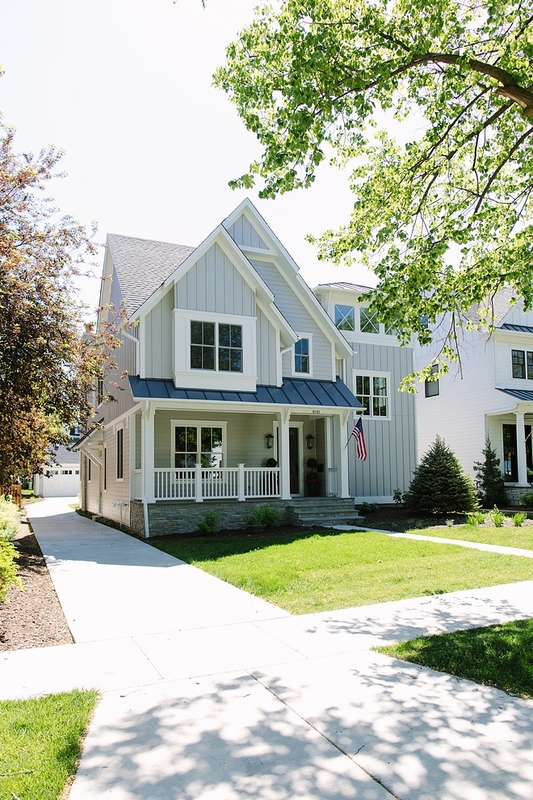 Built by Timber Trails Development Company and with interiors by the talented Julie Howard (previously featured here, here & here), this beautiful home is an east coast inspired home located in Western Springs, a suburb about 20 miles outside of Chicago. The home’s exterior commands attention with it’s stately tower topped with X details on the windows. Inside the tower is a three story floating staircase that has a marvelous view of the chandelier above. 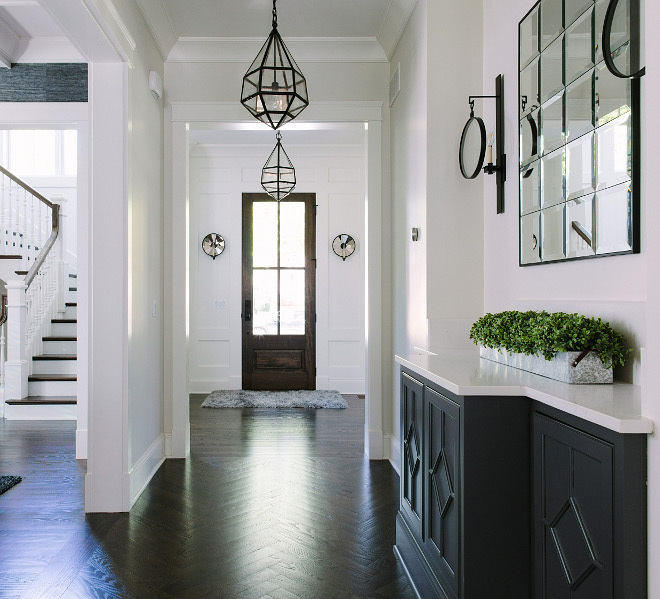 When you enter the front door, a long hallway lined with mercury glass lanterns leads you to the open concept kitchen and family room where a built-in banquette steals the show because of its leaded glass windows. I hope you enjoy this tour and make sure to pin your favorite interior design pictures! 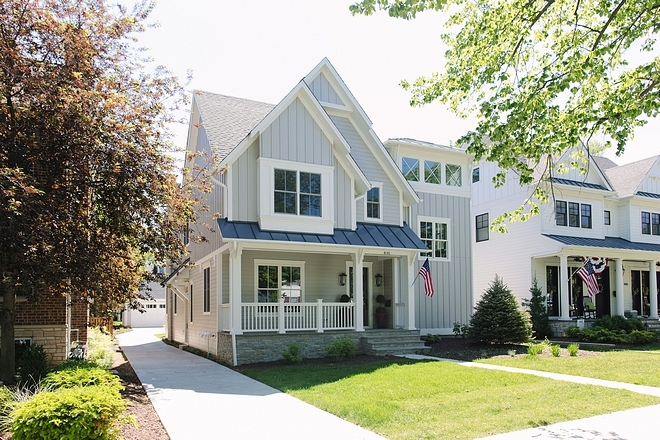 Exterior finishes: Hardie siding and board and batten in Pearl Gray. Exterior Trim: Hardie Trim in Arctic White. Windows: Marvin Integrity windows with SDL including leaded glass windows. Roof: Dimensional shingle asphalt roof with metal roof details in Pewter Gray. 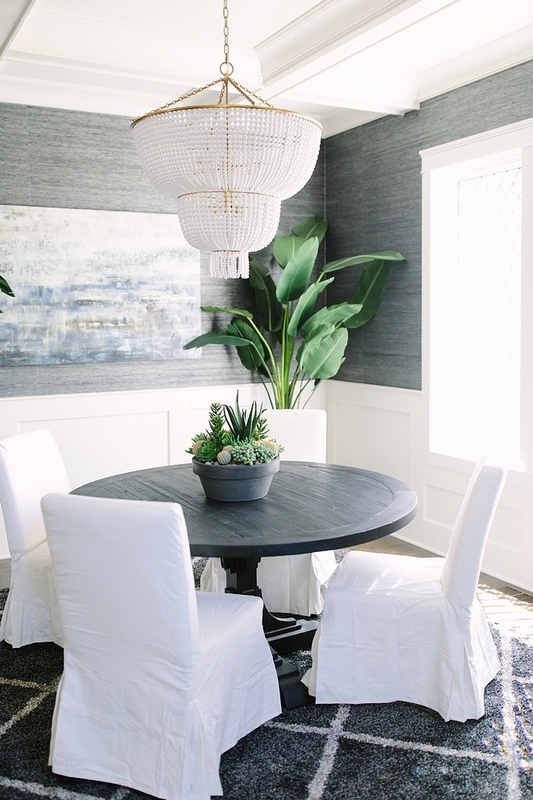 This home comes to show that dark hardwood floors with white wall paneling is a classic choice that will always stand the test of time. 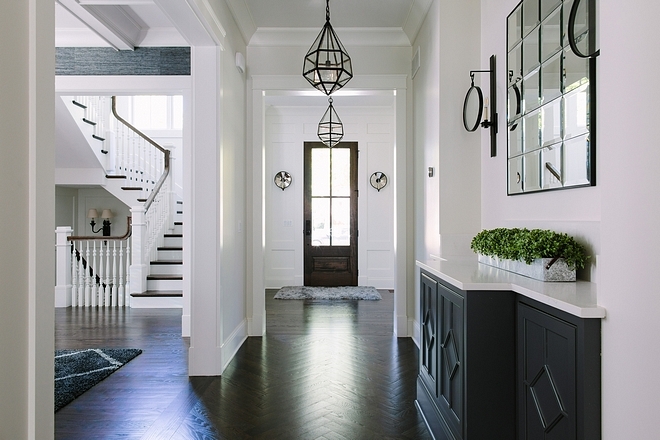 Sconces on either side of door: Visual Comfort. Located just across from the dining room, this buffet features inset custom-designed cabinetry painted in Benjamin Moore’s Iron Mountain. Buffet is crafted by Palos Fine Carpentry. Paint color is Benjamin Moore Iron Mountain. Countertop is Caesarstone Calcutta countertop with custom designed backsplash. 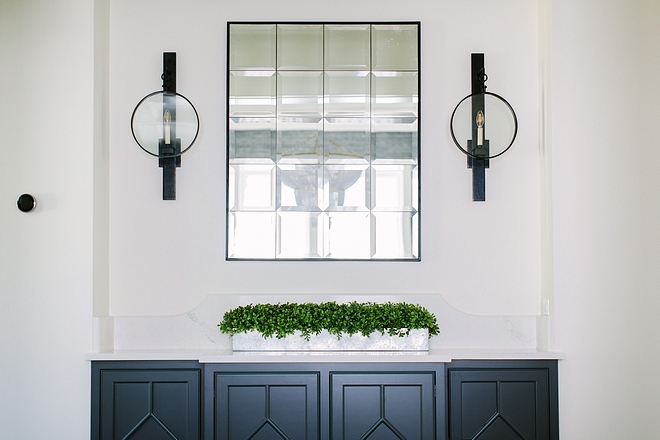 Mirror – Homegoods – similar here. Beautiful Buffets: here, here, here, here, here & here. Herringbone hardwood floor uses Red Oak stained 50/50 Ebony and Espresso. 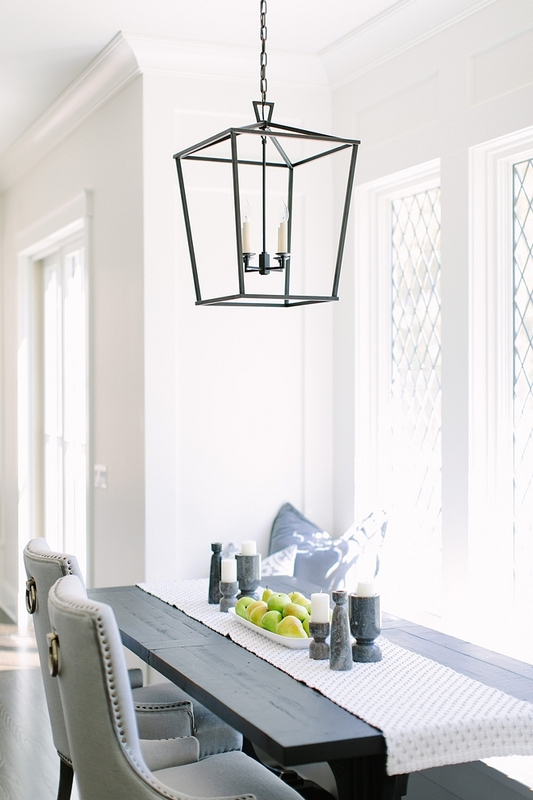 The dining room features coffered ceiling, custom wainscoting and leaded glass windows. Dining Table: RH Discontinued – similar here, here, here, here, here (light wood), here & here (smaller). Sofa and Chairs – Ikea – similar here. Wallpaper: Thibaut grasscloth Wallpaper – similar here. The kitchen, breakfast room and family room feels connected and open to each other. Kitchen is almost 20’ long and the custom cabinets are by Palos Fine Carpentry. The dark grey island is painted Benjamin Moore’s Iron Mountain. Hood is by Modern Aire – similar here. 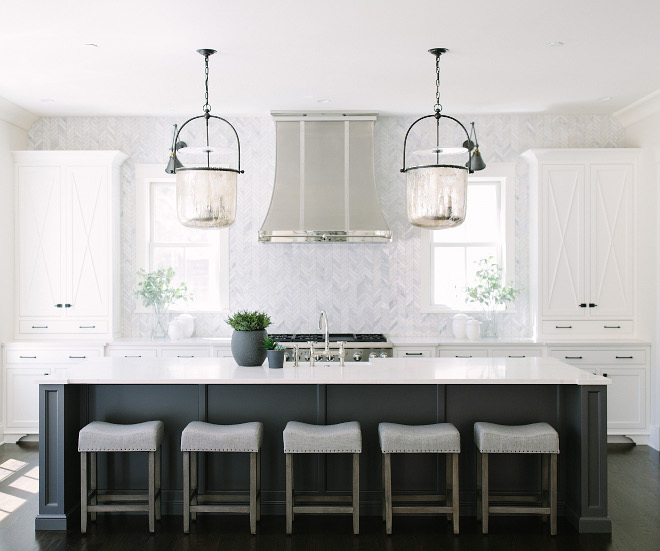 Cabinetry: White inset custom designed and crafted cabinetry painted in Simple White by Benjamin Moore. Barstools: Target – Other Beautiful Counterstools – many styles: here, here, here, here, here, here, here, here, here & here. Refrigerator: 32” Electrolux Ref. and 32” Electrolux Freezer (stainless steel) – Trim Kit: here. 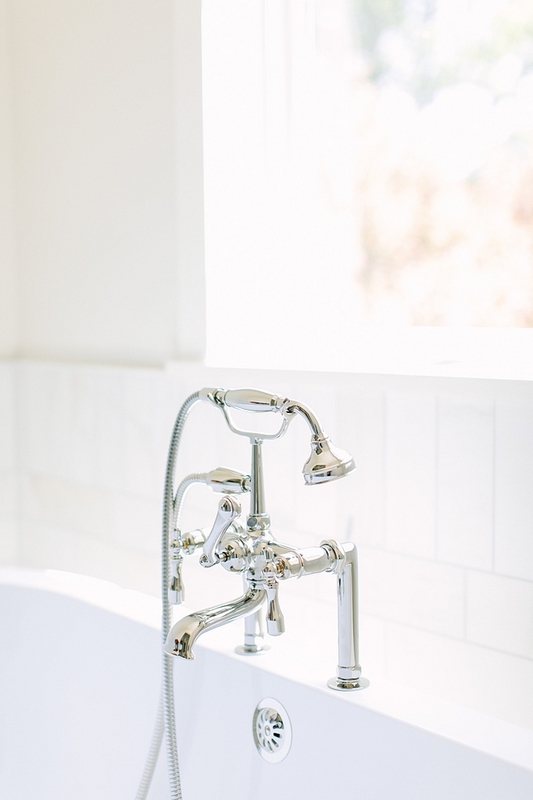 Kitchen Faucet: Kohler faucet – Parq in Polished Nickel. Apron Sink: Kohler Apron Sink. Cute Indoor Planters: here, here, here, here & here. 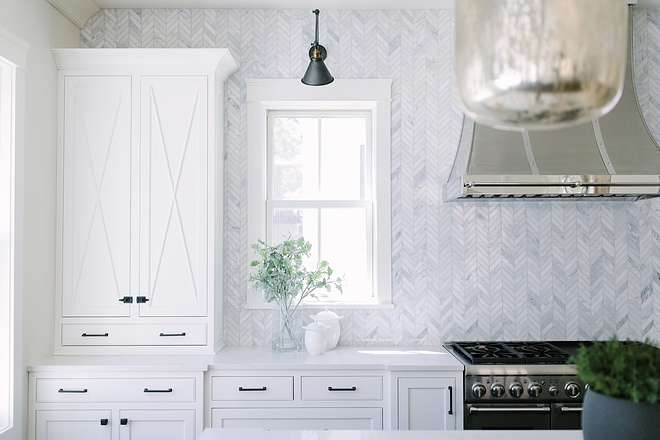 Backsplash is Carrara marble tiled backsplash to ceiling in Chevron Pattern – similar here. Kitchen Hardware – Top Knobs – Pulls, Knobs, Cabinet Latch, Appliance Pulls. 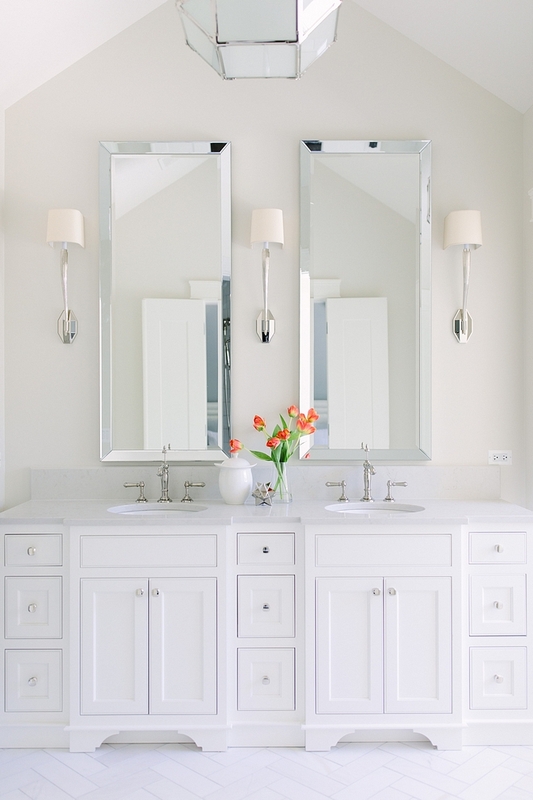 Sconces over windows by RH – similar here & here. Similar Countertop Decor: Clear Glass Vase, Faux Floral, White Jars (vases). Range is a 48” Thermador professional range – similar here. Other Appliances: Thrermador stainless steel dishwasher and Thermador Microwave drawer in island. Breakfast nook features built-in banquette with millwork detail and leaded glass windows by Searls Windows for Marvin. Dining Table: RH Discontinued – similar here. Dining Chairs with Gold Ring on the back – Home Goods – similar here & here (without ring). Similar Candle Holder: here & here. 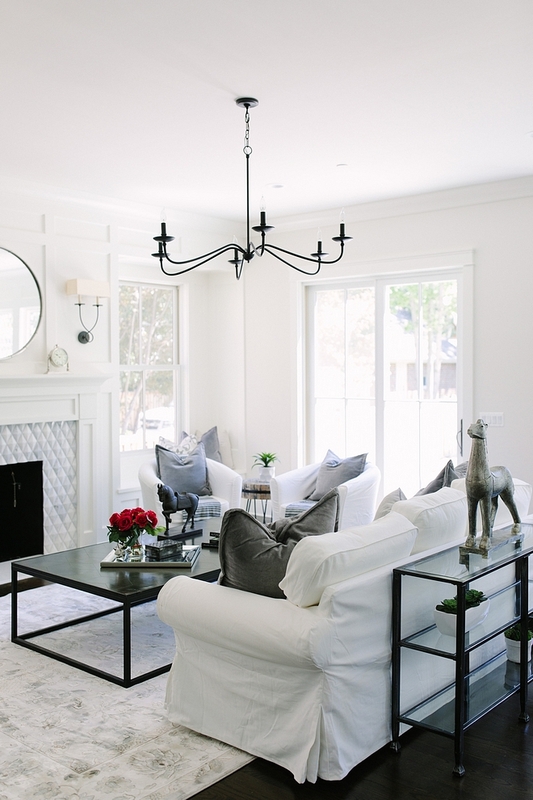 The family room features a white and grey color scheme. All mirrors, art, pillows, and accessories are from Home Goods. 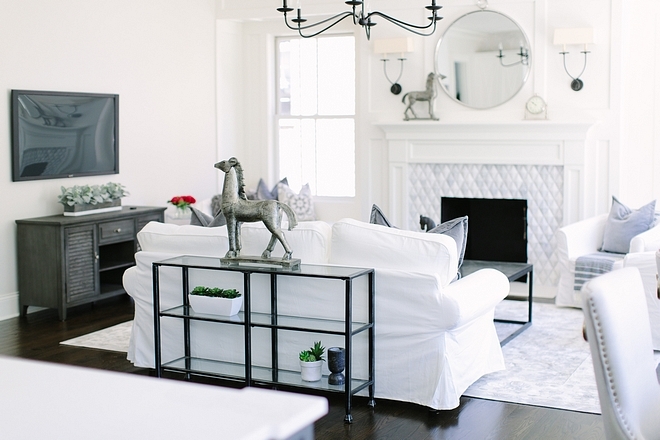 The family room is painted Classic Gray by Benjamin Moore. Wood burning fireplace using trim to create window seats on either side and a really fun tile around the surround. Sconces over Fireplace: Visual Comfort. 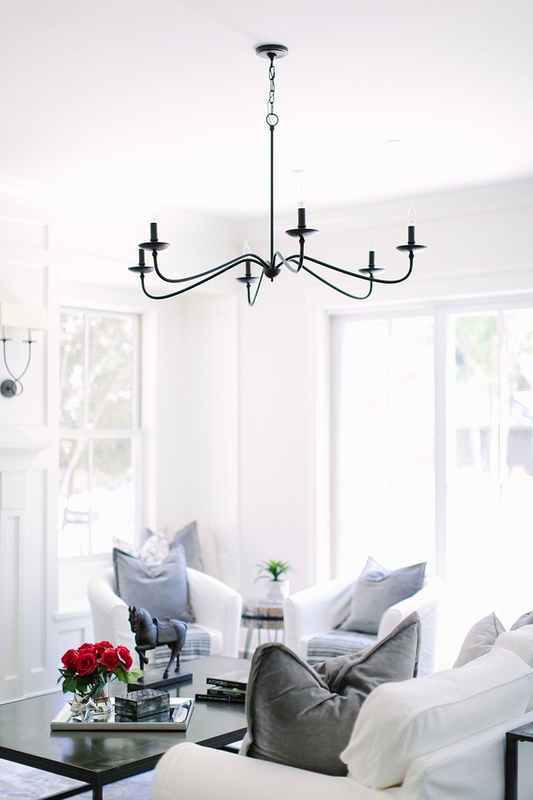 Chandelier is from Pottery Barn. 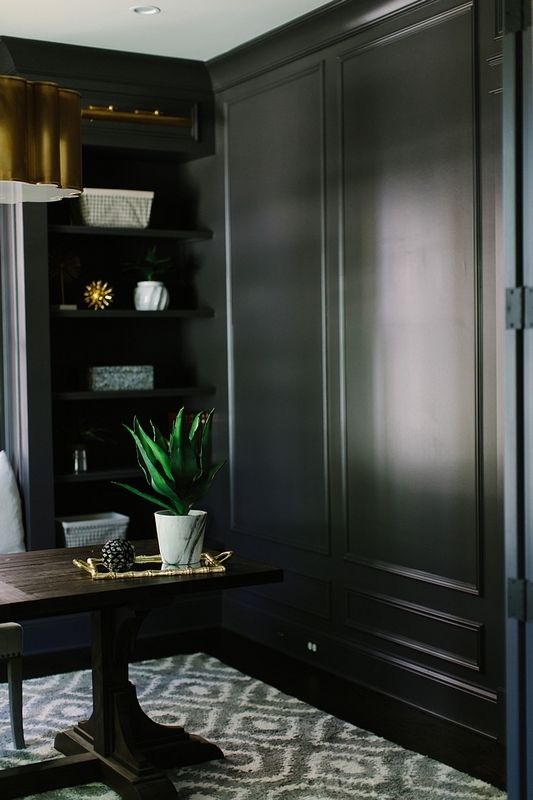 The home office features a built-in banquette flanked by bookcases with cabinet lighting. Gorgeous, right?! Table RH Discontinued – – similar Pier 1. Ceiling light fixture by Visual Comfort. Beautiful Grey & White Rugs: here, here, here, here, here, here & here. 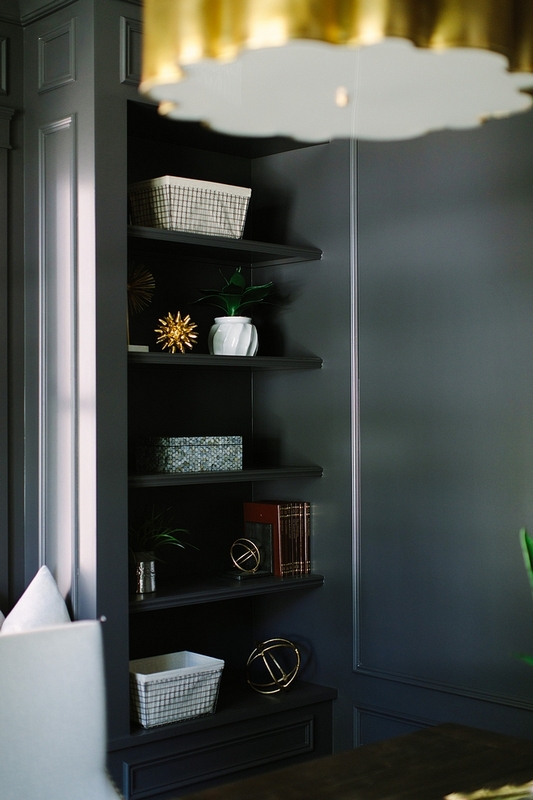 The whole room is painted in Benjamin Moore Iron Mountain – semi gloss. 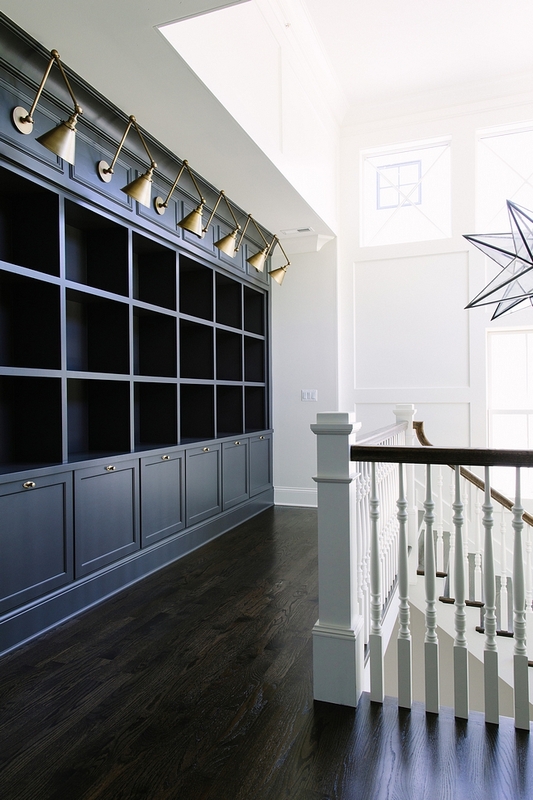 The second floor features a 14’ built-in cabinetry and bookcase with library lighting. Color is Benjamin Moore Iron Mountain. Lights – RH – similar here & here. 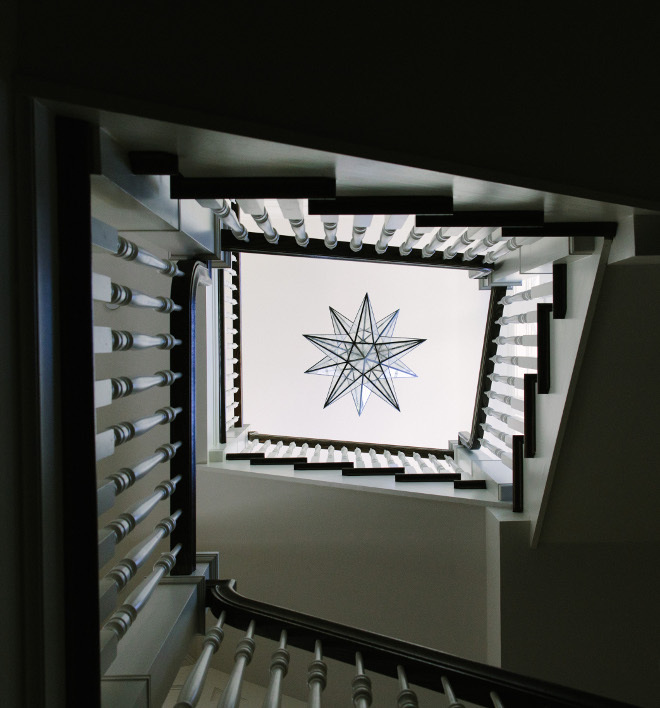 Chandelier: 48” Moravian Star Chandelier. 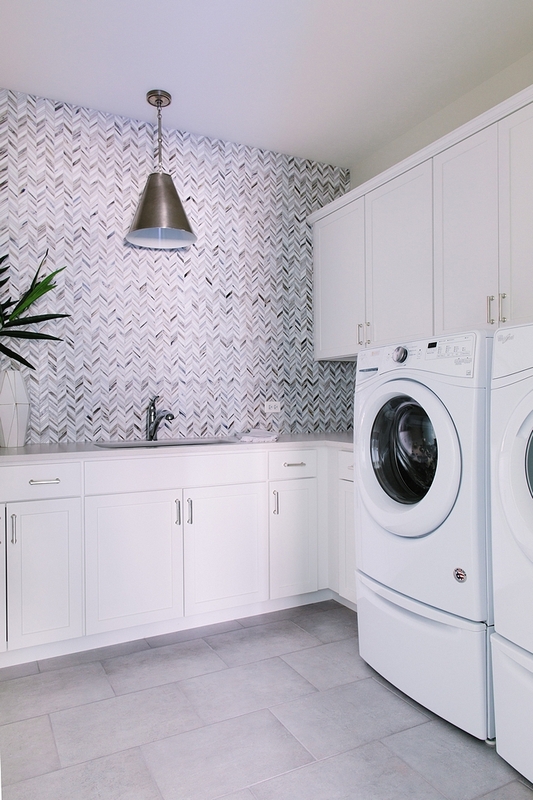 The second floor laundry room features marble backsplash to ceiling (similar here) and Caesarstone countertops in Fresh Concrete. 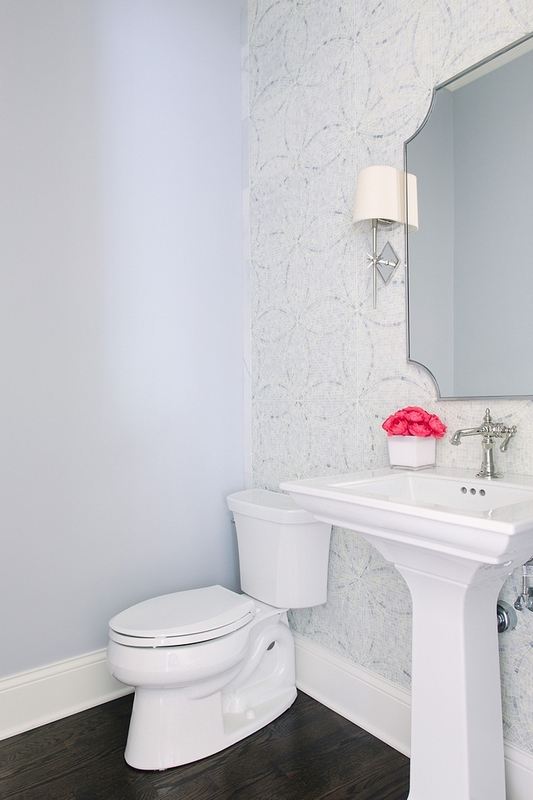 Powder room features a pedestal sink; Memoirs Stately by Kohler with Artifacts Faucet also by Kohler in Polished Nickel. 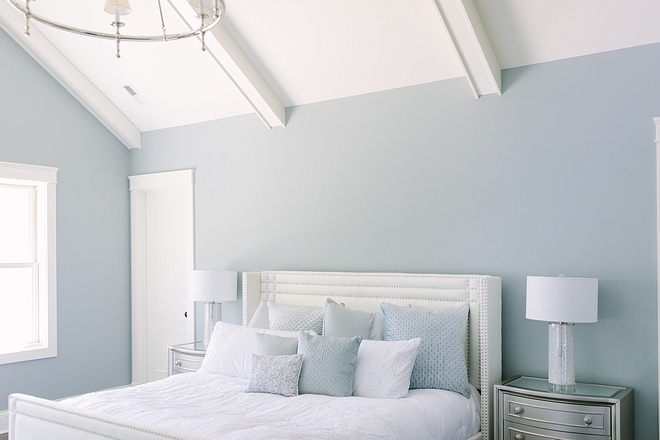 Paint color is Classic Grey by Benjamin Moore. Accent Wall: Marble mosaic wall. 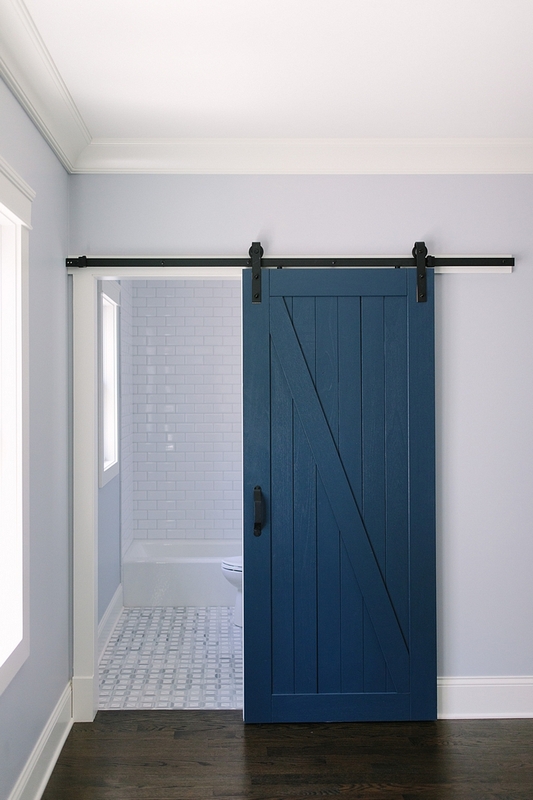 Barn door is painted in Newburyport Blue by Benjamin Moore. 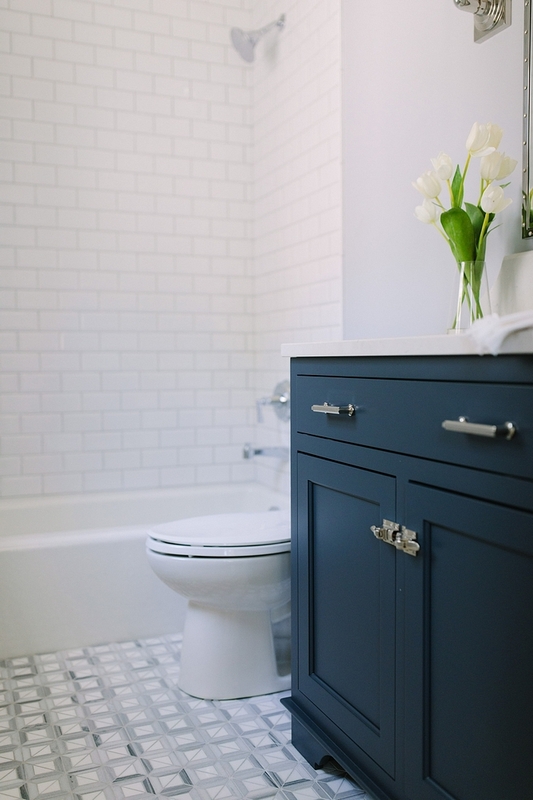 Cabinetry: Navy blue inset custom-designed and crafted. Cabinet painted Newburyport Blue by Benjamin Moore. 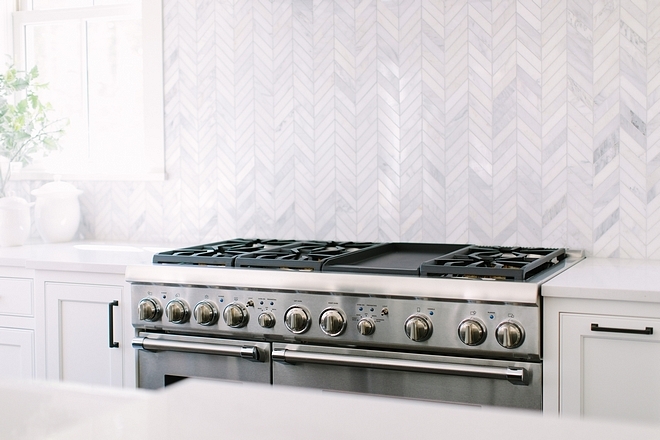 Countertop: Caesarstone countertops in Misty Carrara. Marble floor tile is from Floor and Decor. Other beautiful mosaic tiles: here, here, here & here. Hardware (Polished Nickel): Pulls, Cabinet Latch. Tub Tile: Beveled subway tile bathtub. 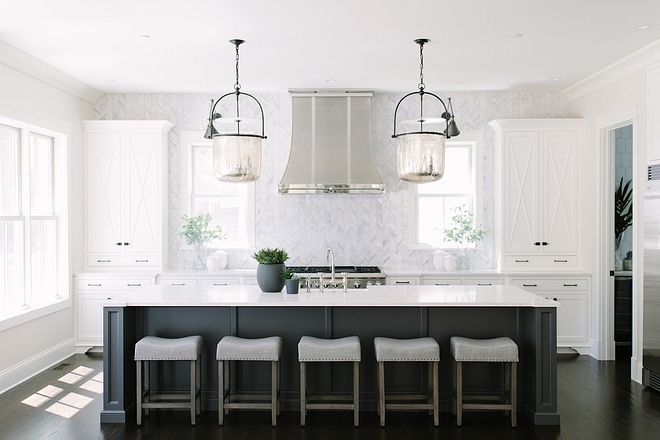 Paint Color: Boothbay Gray by Benjamin Moore. Ceiling is vaulted with beams. Chandelier is by Visual Comfort. Pillows were from Joss & Main – similar here, here, here & here. 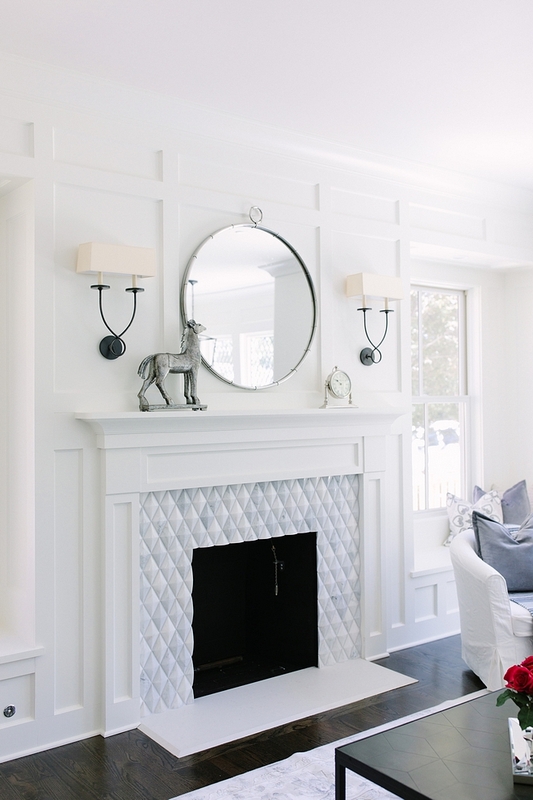 Paint Color – Walls are Classic Gray by Benjamin Moore and cabinet is Benjamin Moore Simply White. Knobs: Schaub and Company – one of my favorite knobs! Similar Mirrors: here & here. 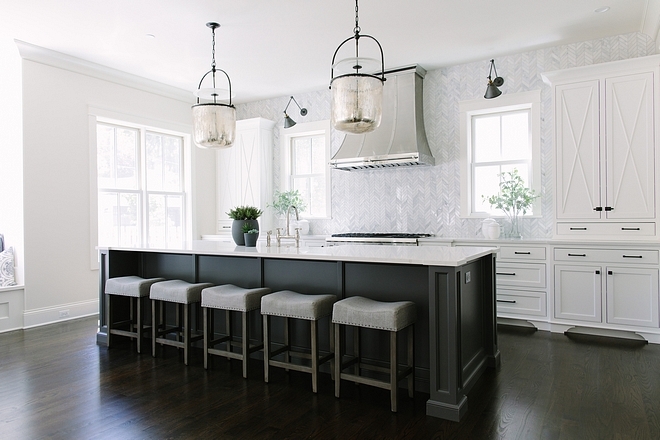 Caesarstone Countertops in London Grey. 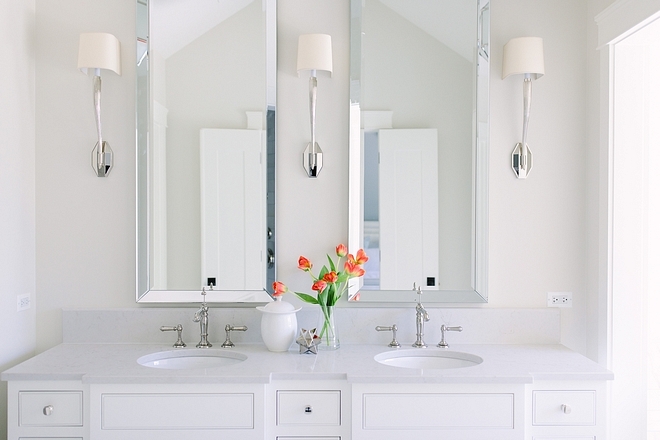 Sconces over Vanity in Polished Nickel: Visual Comfort. 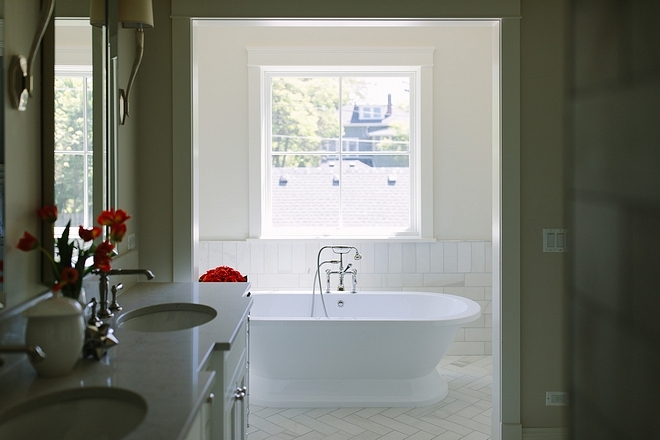 The bathroom also features a separate tub area with Carrara Wainscoting and Freestanding Soaker Tub. 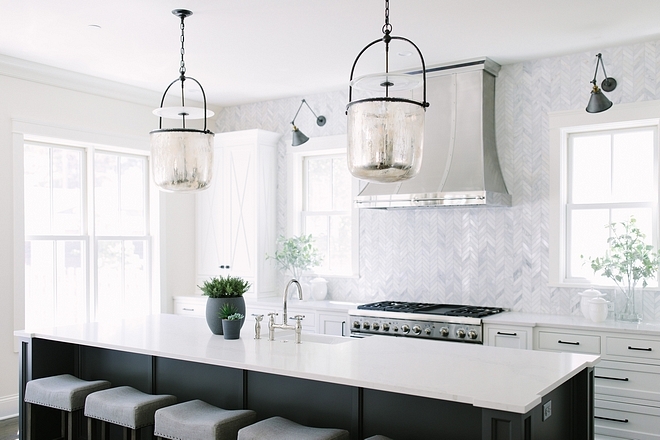 Carrara Herringbone floor is Royal Satin Carrara. Similar Telephone Tub Filler: here. 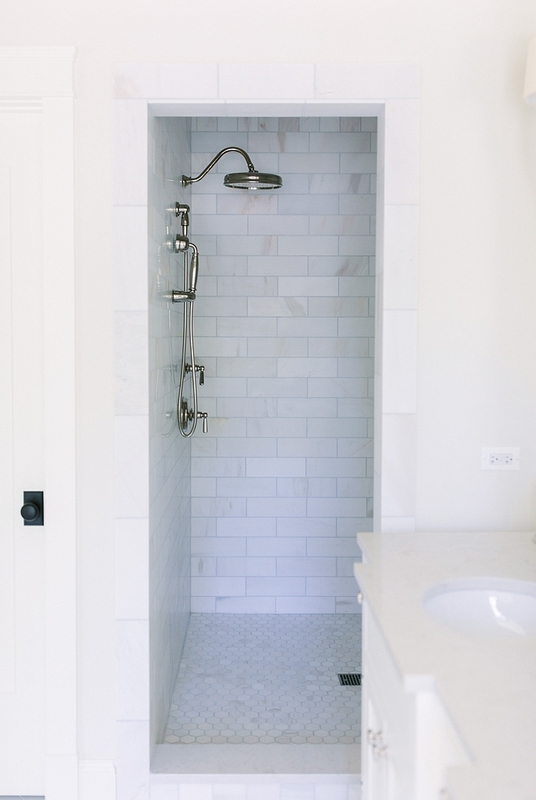 Shower combines large Carrara subway tile with hex honed Carrara floor tile. 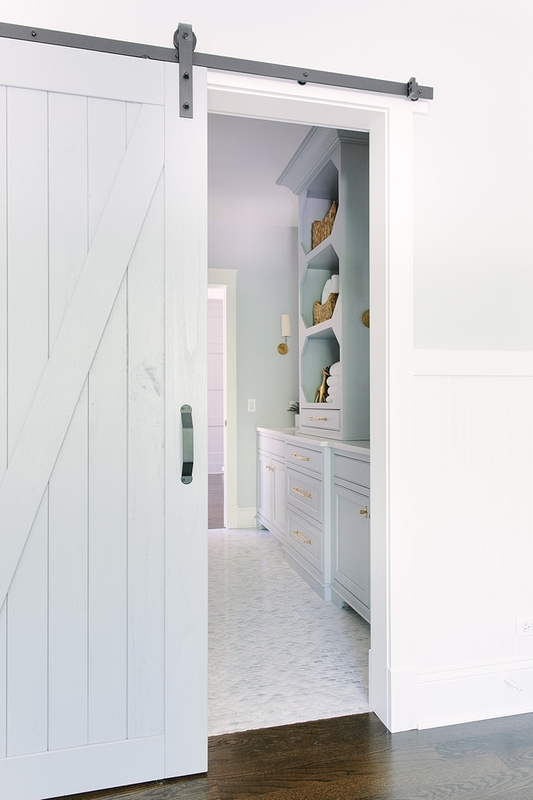 Barn door is painted Benjamin Moore 1606 Cobblestone Path. Cabinet: Grey inset custom-designed and crafted cabinetry including shelving tower by Palos Fine Carpentry. 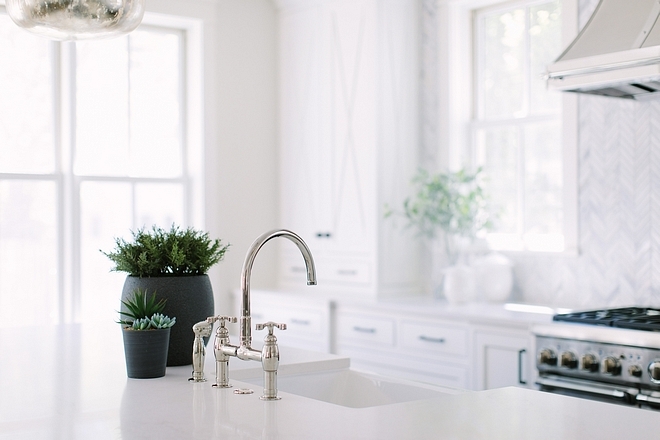 Caesarstone countertops in Misty Carrara. Floor tile is Marble floor and shower in Hampton Carrara by the Tile Shop – Other beautiful tiles: here, here, here & here. 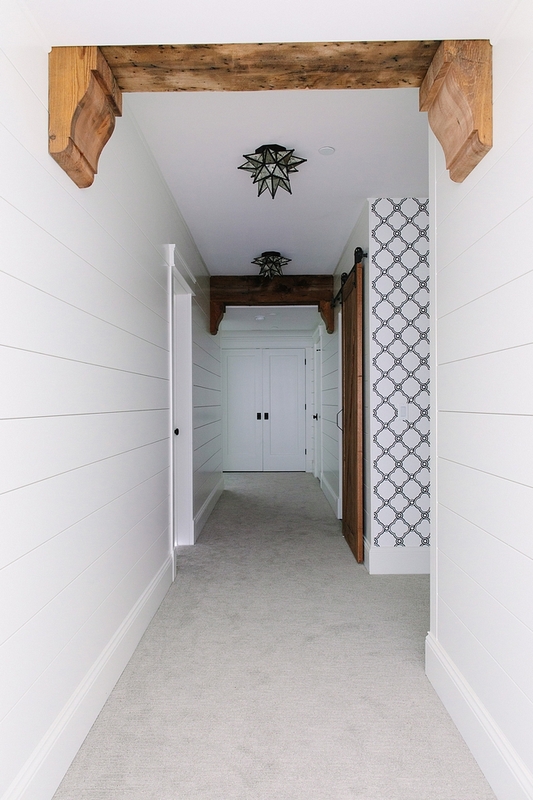 The basement features shiplap walls, painted in Benjamin Moore Simply White and rustic ceiling beams. The exposed beams are actually barn wood that the designer covered duct work to disguise it. They had the barn wood corbels made at All American Reclaim where they take apart barns and are craftsman with old wood. Room is painted in Classic Gray by Benjamin Moore. Light fixture – Visual Comfort. “Hang-out Nook” under second staircase. Isn’t this a brilliant idea?! 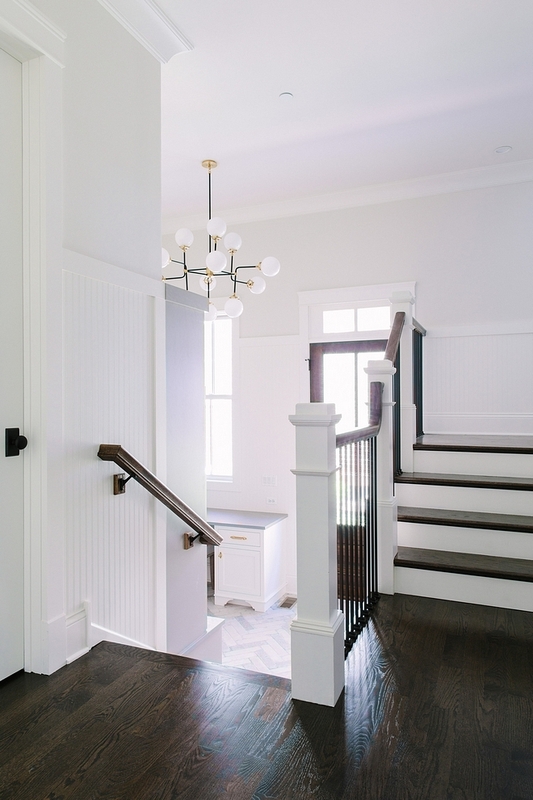 Wainscoting and trim are painted in Simply White by Benjamin Moore. 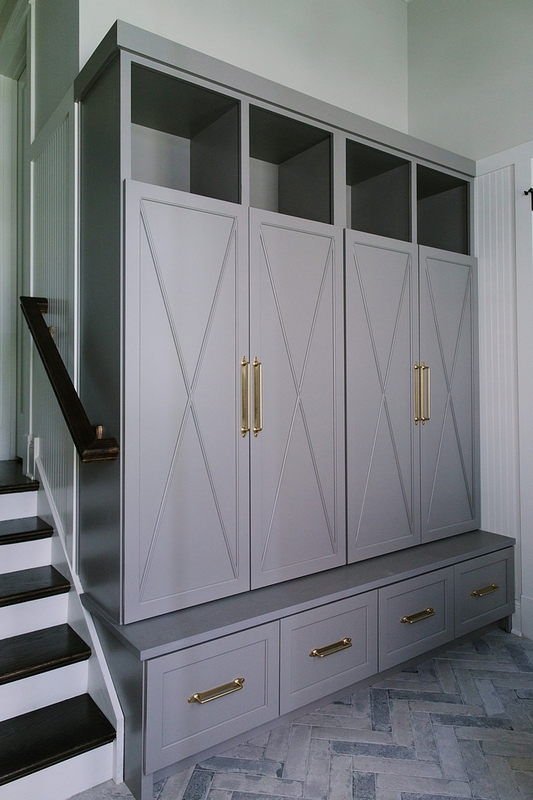 Mudroom cabinet is custom-designed and crafted and it features cabinetry with X detail. 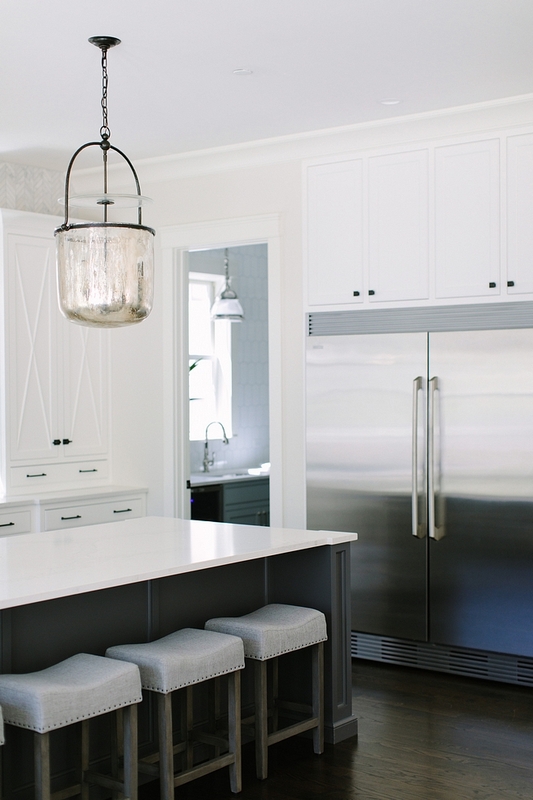 Cabinet paint color is Benjamin Moore Graystone with Caesarstone ledge in Sleek Concrete. 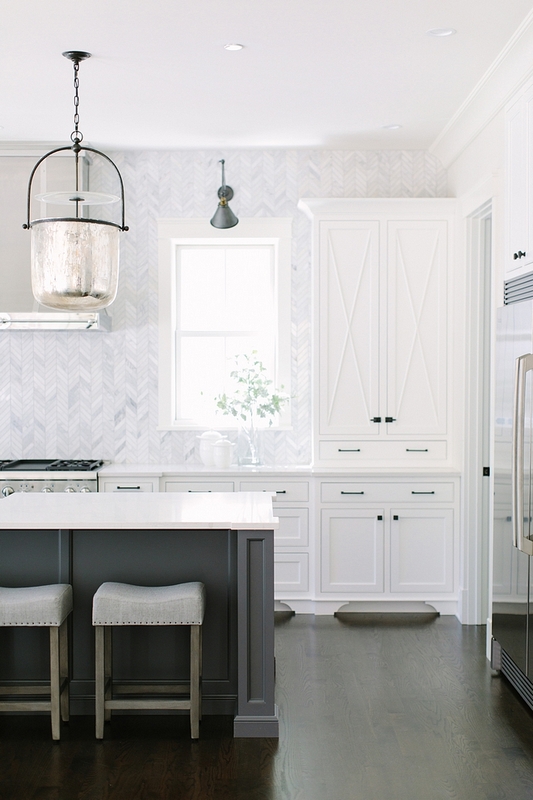 The room also features beadboard walls and brick herringbone flooring in Porcelain Tile. Similar Brick Porcelain Tile: here, here, here & here. 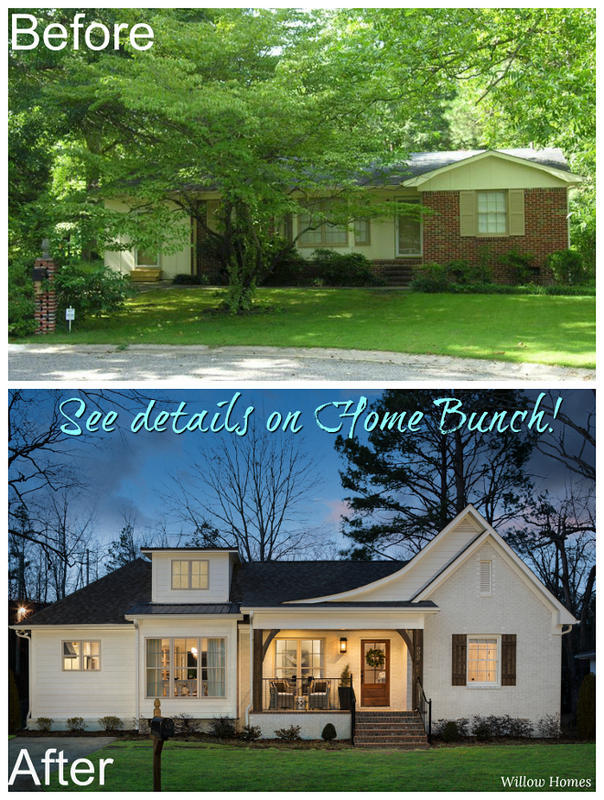 Many thanks to the designer, Julie Howard, for sharing all of the details above! Builder: Timber Trails Development Company (Instagram). Joss & Main: Rug Sale! Up to 70% Off!!! Wayfair: Up to 70% OFF – Huge Sales on Decor, Furniture & Rugs!! Pottery Barn: New Arrivals!!! Up to 70% Off! West Elm: Mega Sale – 70% Off sales! Anthropologie: Extra 40% Off Sale Plus 20% Off Furniture + Decor. Urban Outfitters: Hip & Affordable Home Decor – Big Summer Sales!!! Horchow: Flash Sale: Up to 55% Off!!! One Kings Lane: Save Up to 70% OFF! Free Standard Shipping on Orders over $99! Williams & Sonoma: Spring Clearance: Up to 75% OFF!. Pier 1: Biggest Memorial Day Sale: Up to 50% Off! JCPenny: Final Hours of Huge Sale. Kitchen and Mudroom Gut Renovation Ideas. Before & After: Small Farmhouse-Style Home Renovation. Santa Barbara Beach Home Design. 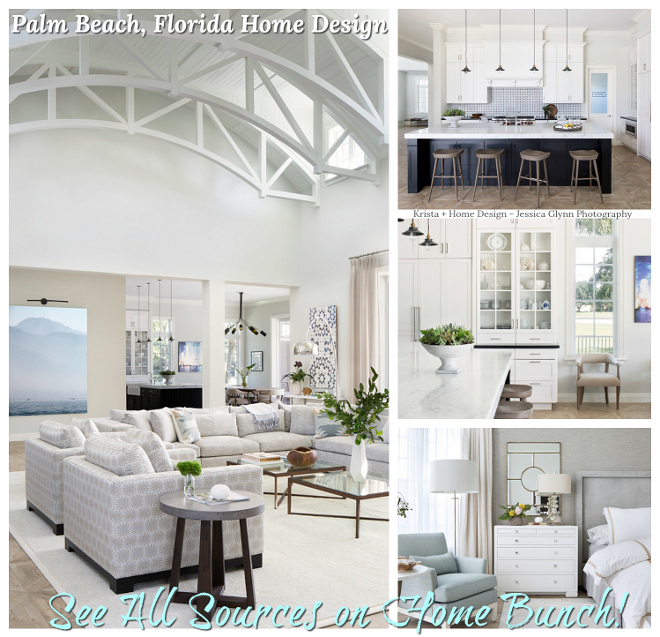 Interior Design Ideas Coastal Florida Home. New-Construction Home for First-time Home Buyer. California Beach House with Beautiful Coastal Interiors. 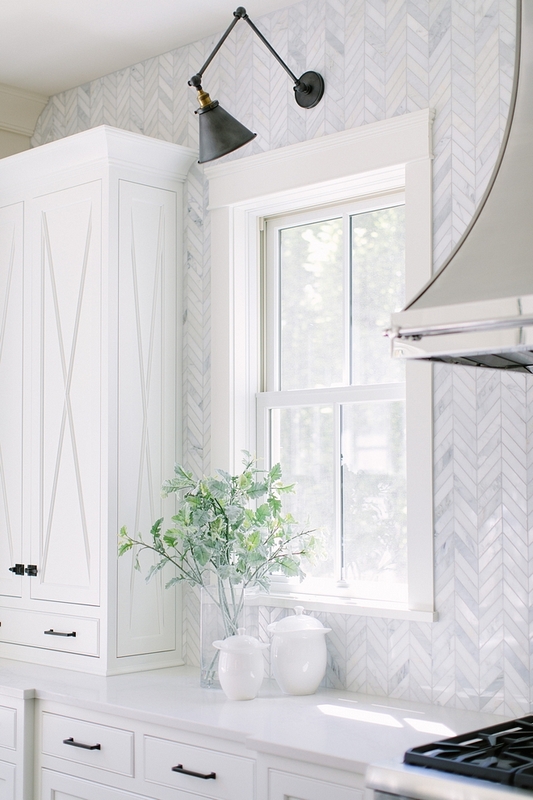 Mudroom -do you have more details on the brick herringbone flooring in Porcelain Tile? The tile is from “Bedrosian Tile” – similar here.